If I’d have to choose THE one tool to have with it me in a survival situation, there’s no doubt that I’d choose a full tang survival knife. Why full tang? you may ask. Well, you should be aware of the fact that a true survival knife must be able to perform a variety of heavy-duty jobs such as digging, chopping wood, carving, cutting/slicing, prying, hammering, etc… The list is endless, these are just a few basic tasks a good survival knife must be capable of performing without breaking. What’s most important for you is knowing how to choose the adequate tool, the one that’s capable of doing well in every situation imaginable. 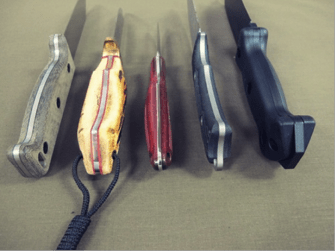 Why to go for a Full Tang Survival Knife? A full tang is that one feature that makes for a virtually indestructible knife. Full tang means that the blade and the handle are made from the same piece of steel. This makes for a robust construction, capable of enduring all types of punishment without breaking. The best full tang survival knives feature these elements: high quality steel (the best one is high carbon stainless steel like VG 10), a thick blade and an adequate heat treatment. In short, you should go for a full tang survival knife made by a reputable company.